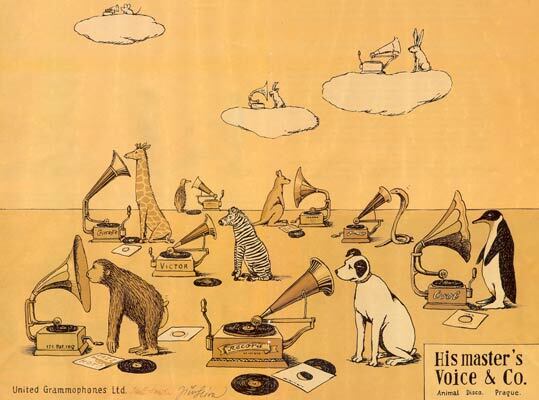 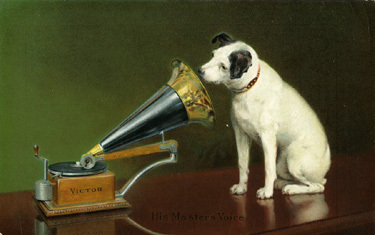 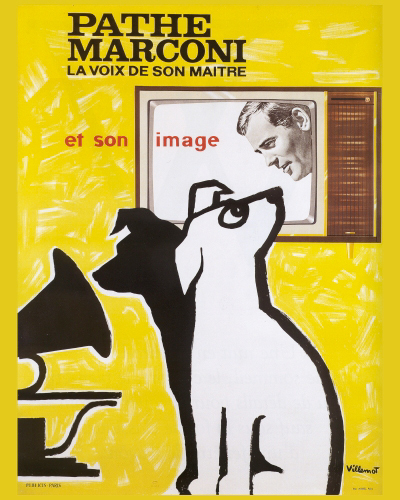 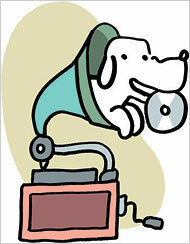 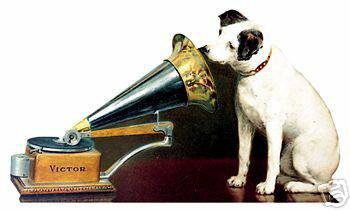 NipperArt is a gallery featuring artwork related to Nipper, the Terrier that was the trademark for the Victor Talking Machine Company and its later RCA incarnation. 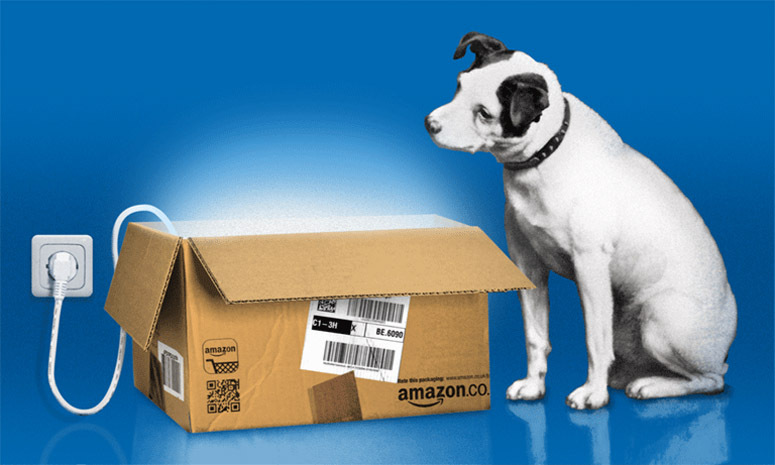 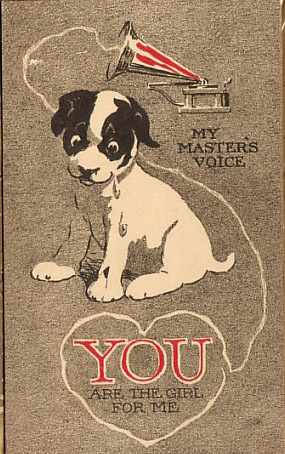 This part Bull Terrier, part Fox Terrier dog didn't find a home with Edison but Nipper did go on to become one of the most recognized product images in the history of advertising. 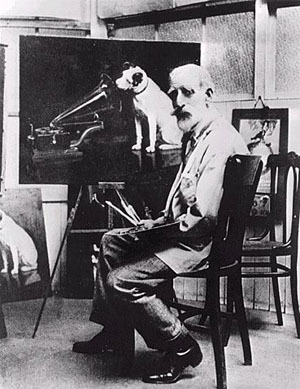 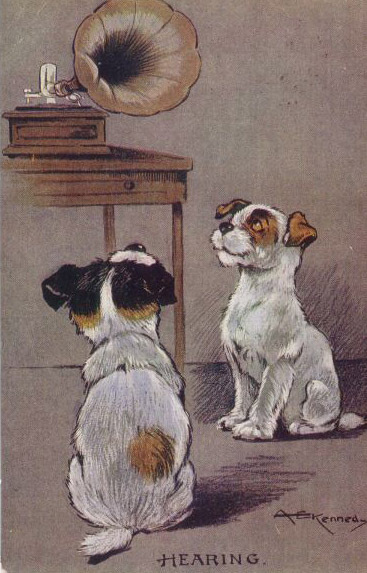 Being so famous Nipper has inspired numerous cartoons, parodies and other derivitive creations for over a century. 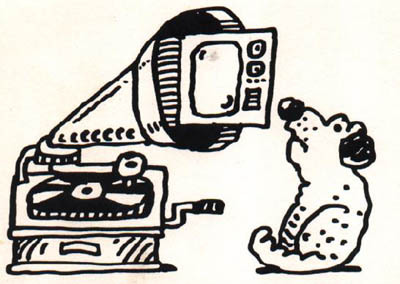 Enjoy how this icon associated with the beginning of the phonograph's entry into the home continues to be seen in the Twenty-first Century in various formats still listening to His Master's Voice. 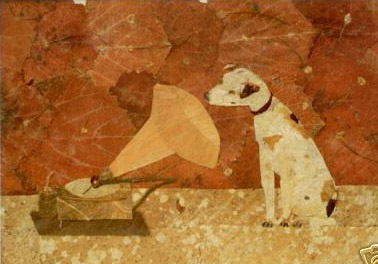 Media: Oil on canvas, 36" x 28"
Description: The original painting by Francis Barraud displayed an Edison-Bell Phonograph as the featured talking machine"
Description: Francis Barraud revised his Phonograph painting with what was to become known as "His Master's Voice"
Leonard Petts, author of the Story of Nipper and the 'His Master's Voice' picture (published for The Talking Machine Review International, 1973), quotes Alfred Clark (Managing Director of the Gramophone Company in 1935) as follows: "He (Francis Barraud) took it to a company then prominent in the sale of wax cylinder phonographs, to see whether they were interested enough to acquire it. 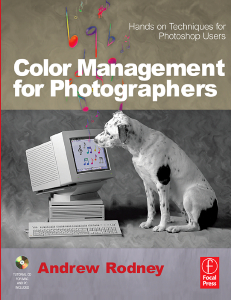 They did not seem at all impressed by the originality and beauty of the picture, but asked for more time to think it over." 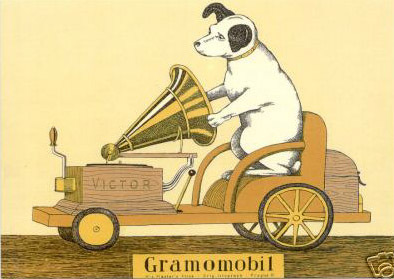 Barraud replaced the cylinder machine (an Edison commercial model) with a brass horn and a talking machine supplied by The Gramophone Company. 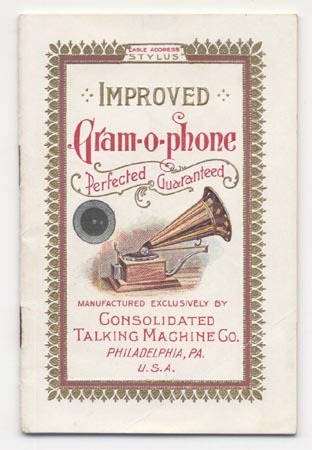 Johnson's company then purchased the updated picture. 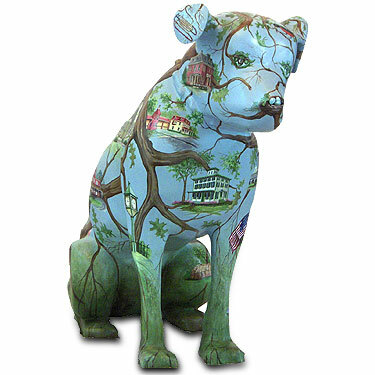 This is just one of the 30 statues that was displayed in Moorestown, NJ in 2005. 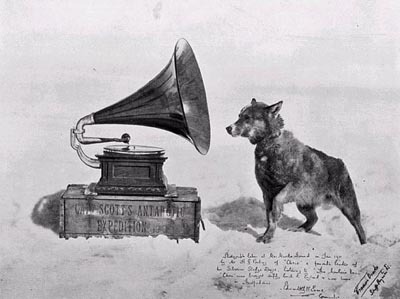 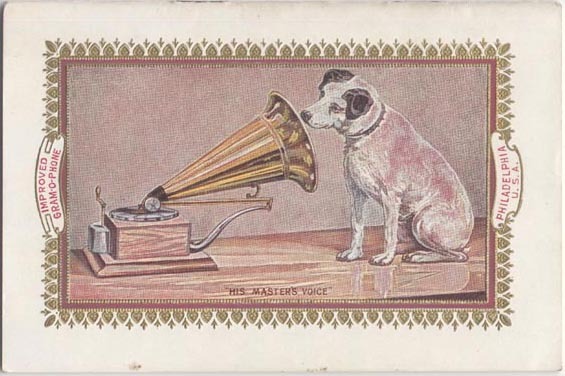 Media: Color postcard, Berlin, 4 1/4" x 5 3/4"
Media: Collage, color postcard, 4 1/2" x 5 3/4"
Artist: Tom Brown, Publisher: Davidson Bros.
Scott's Antartica Expedition replaced the fox terrier with a husky listening to "His Master's Voice." 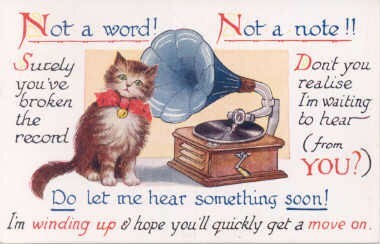 A cat takes the place of Nipper in this postcard that depicts a cat waiting to hear something (instead of Nipper listening to his master's voice). 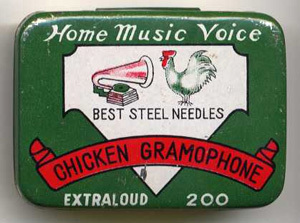 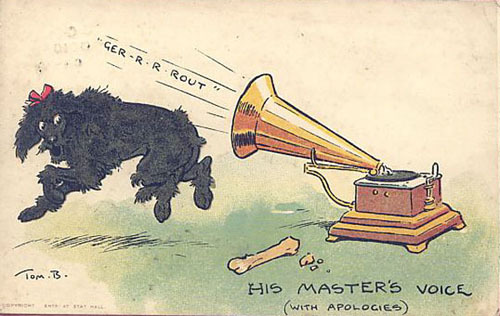 The card also features two double-meaning phonograph related phrases: you've 'broken the record" and "I'm winding up"
This postcard is one of many Nipper parodies that changed the "o" in "Voice" to "i", to create "His Master's Vice". 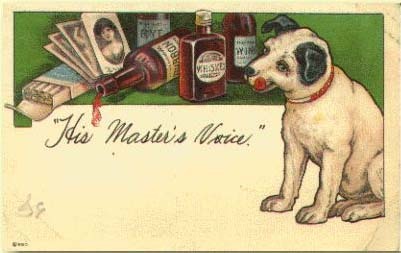 Many of these cards featured Nipper and the whiskey bottle. 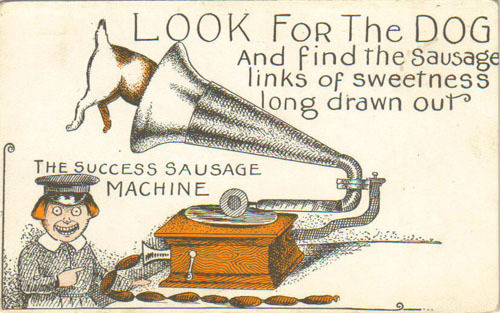 This card actually depicts multiple vices. 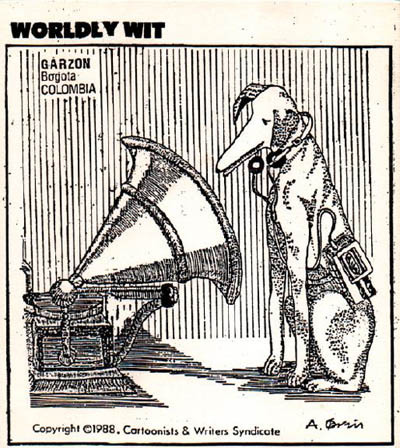 But since Nipper represented the "World's Greatest Music", isn't it natural that these other vices would join Nipper to complete the trilogy of "Wine, Women and Song?" 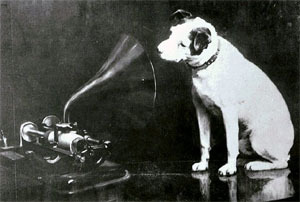 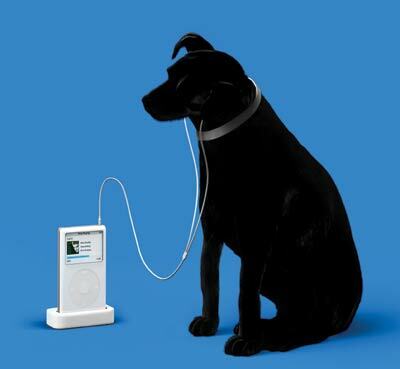 A Nipper-like dog watches and listens to music on a computer...the new master of the 21st century. 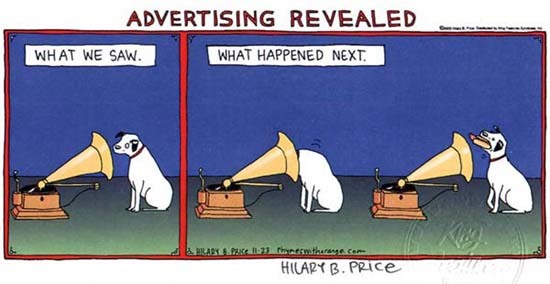 Media: Advertisement reprint on canvas, 8" x 10"